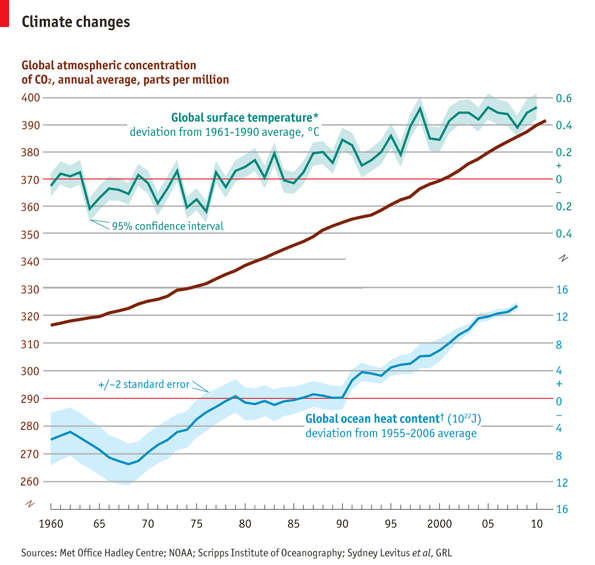 A great Daily Chart from the Economist published on the 2nd of May shows the relationship between carbon dioxide and the temperature of the earth. Because the rise in temperature of the atmosphere is influenced by, for instance, the number of particles reflecting sun light back up before it can heat the earth, the temperature of the oceans is a better guideline. In the chart below a steady rise can be seen in the heat content of the oceans. With the above in mind I read the results from the survey done by SustainAbility among 642 sustainability experts from 77 countries. 72% of them agreed that the green economy is the right theme for Rio+20. It is clear that the leaders in business see the importance of reducing their carbon footprint. From the survey it is also clear that change will have to come bottom-up. Consumers, producers of A-brands and investors are pushing sustainability, governments are staring into the headlights of an approaching car unable to react. The survey reflects this: only 13% of the respondents expect Rio+20 to contribute to sustainable development. 3. Provide low cost financing. This is sound advise but not easily implemented. It makes sense to state that those who will find a business model that answers the three requirements, will be favoured by the market. The rise of solar is also predicted in the publication by The Economist, The world in 2050, Megachange. Matt Ridley predicts that gas and solar will be the dominant and cheap sources of energy in 2050. The influence of low gas prices can already be felt as it directly impacts the price of thermal coal, which according to the FT dropped on the 1st of May for the first time in 18 months below $ 100 per tonne. This might encourage the use of coal, which in turn increase carbon emissions. This can only be curbed by strong government regulation, taxing the carbon footprint of products, punishing those that were produced with energy generated by coal fired power plants.